With such abundance on the market the board makers try to draw attention of customers by any means: textolite often serves as an easel and a standard package is stuffed with as much software and various accessories as possible. 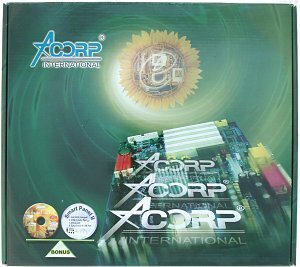 Acorp also follows this way: PCBs of this company are not typically green, and CDs bundled contain not only necessary drivers. 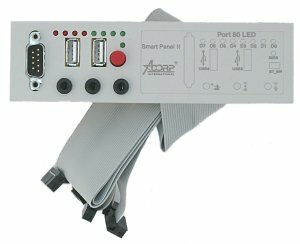 Now the Acorp's boards will come together with the SmartPanel II which was announced quite a long time ago but wasn't put in any box yet. 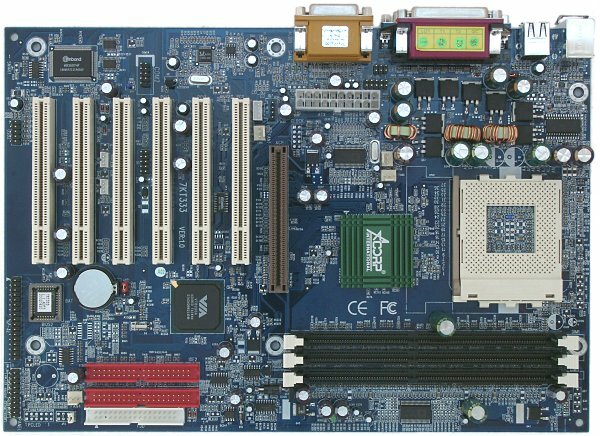 The layout has some drawbacks: the IDE and FDD connectors are located behind the PCI slot, the power connector and audio-ins are between the AGP slot and the back panel of the board, and when a video card in installed it's not easy to handle the memory modules. It's not difficult to reach jumpers even when the board is already installed. Their functions are shown on the textolite. The 3-channel switching voltage regulator incorporates 3 capacitors of 3300 uF and 3 of 2200 uF and several less capacious ones. audio controller based on the Avance Logic ALC101 AC'97 codec. The board has connectors for SmartPanel II which looks like a bracket designed for a 5" bay. The panel incorporates 2 USB ports, a serial port, audio controller Line-Out, Mic-In, Line-In, 9 LEDs and a Flash button for BIOS booting (the given model doesn't support this function). The LEDs monitor the booting process and you can find out about problems using the table of POST codes. Non-unsoldered connectors: jumpers for a CPU frequency and a SmartPanel II connector to choose the bootable Flash EEPROM (there is no space for a second Flash EEPROM chip in this PCB version). temperatures of the processor (a built-in sensor) and the board (a built-in sensor). There are 2 connectors for adjustable connection of fans and 1 for non-adjustable connection. 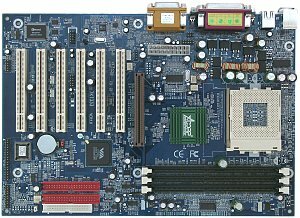 Brief characteristics of the board: memory slots - 3 DDR SDRAM; expansion slots - AGP/ 6 PCI; I/O ports - 2 COM/ LPT/ 2 PS/2/ 4 USB 1.1; dimensions - 305x210 mm. We used the latest available version of the BIOS - 1.2. The board is not extraordinary, but it is not typical of Acorp. It works not very fast but confidently, which is peculiar to all its inexpensive products. Only the SmartPanel II can attract your attention exactly to this model.